Ms. Ngwenyama came to international attention when she won the Primrose Competition and Young Concert Artists International Auditions - both at age 17. Her debut recitals in Washington, D. C. at the Kennedy Center and in New York at the 92nd Street ‘Y’ were widely praised, and in 1997 she was recipient of the prestigious Avery Fisher Career Grant. Highlights of Ms. Ngwenyama’s past two seasons include repeat appearances with Christopher Seaman and the Rochester Philharmonic Orchestra and the KwaZulu Natal Philharmonic Orchestra in Durban, South Africa, as well as appearances with Esa-Pekka Salonen and the Los Angeles Philharmonic. Additionally, she “fascinated on viola and violin during recital (The Washington Post)” at the National Academy of Sciences in Washington, D. C. and with the Philadelphia Chamber Music Society. Ms. Ngwenyama has concertized extensively throughout the United States and abroad. U.S. appearances include performances with the Atlanta, Baltimore, and Indianapolis Symphonies as well as the National Symphony Orchestra. She has been heard in recital at Tokyo’s Suntory Hall, the Louvre, the Ford Center in Toronto, the Maison de Radio France, and the White House. Summer festival appearances include Green Music, Vail, San Diego’s Mainly Mozart, Chamber Music Northwest, Marlboro Music Festival, Italy’s Bolzano and Este festivals, and Spoleto USA. Ms. Ngwenyama also enjoys an esteemed reputation as a chamber musician. She frequently collaborates with the Chamber Music Society of Lincoln Center and has also worked closely with the Borromeo, Chilingirian, Miami, Orion and St. Lawrence Quartets. Her recent recordings on EDI have been met with critical acclaim, and her latest performance of the Rubinstein Violin and Viola Sonatas with pianist Jennifer Lim was released September 2006. No stranger to media appearances, “Thula” was featured on the Emmy-nominated Musical Encounter Series with host and cellist Lynn Harrell. She was also a guest on CBS Sunday Morning hosted by arts correspondent Eugenia Zukerman. A full recital and interview of Ms. Ngwenyama was aired on the JAL Classic Special, seen nationally on Japan’s channel We. A dedicated advocate for the arts, she has testified before Congress on behalf of the National Endowment for the Arts. Ms. Ngwenyama was named ‘Zimbo’ of the month for August 2004 by the UK based monthly periodical Go Zimbabwe. She was also featured in Mimi Magazine’s The Hot 21 September 2005 issue. 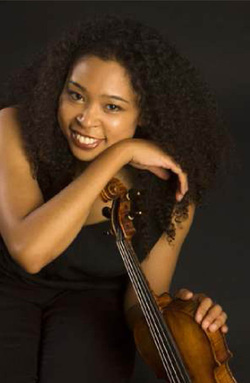 Born in California of Zimbabwean-Japanese parentage, Ms. Ngwenyama graduated from the Curtis Institute of Music in 1996. She attended the Conservatoire National Superieur de Musique de Paris as a Fulbright scholar, and in 2002 received a Master of Theological Studies degree from Harvard University.